EDWARDSVILLE – Senior quarterback Ryan Dailey threw for a season-high 328 yards and three touchdowns while senior receiver William Deemer caught nine passes for 168 yards and two scores to lead Wilkes University to a 46-23 victory over local rival Misericordia University in a Middle Atlantic Conference matchup Saturday afternoon at Schmidt Stadium. Wilkes records its first win of the 2016 season moving to 1-2 overall and 1-1 in MAC play following the home victory. Misericordia slips to 0-3 overall and remains winless at 0-2 in conference games on the season. It didn’t take long for the senior signal caller and senior receiver to get going offensively, and when they did Wilkes exploded for 26 unanswered points over the first two and a half quarters and never looked back. Mike Hauck put Wilkes on the board first when he booted home one of a career-high four field goals on Wilkes opening drive giving the Colonels a 3-0 lead with 11:49 left on the first quarter clock. 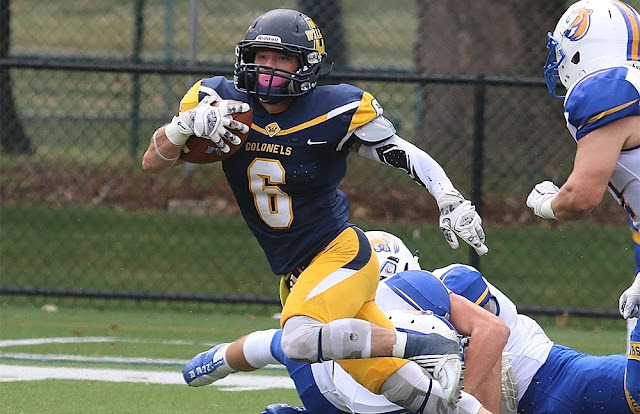 Following a Misericordia punt, the offense was at it again and used an 11-play, 79-yard drive to move into Cougar territory before Jacob Brook dove in from one yard out to push the lead to 10-0 with 6:53 left in the opening period. Dailey found Paul Martin for a big 21-yard play on a third and eight to highlight the long drive. Another Misericordia three and out gave the ball right back to Wilkes at its own 31 yard line. Dailey connected with Deemer for a 37-yard pitch and catch moving the ball into Misericordia territory at the 36. After a series of runs, Dailey and Deemer hooked up for the duos first score of the game, a nine yard touchdown pass giving Wilkes a 16-0 lead with under a minute left in the first. The Colonels defense continued to shut down the Misericordia offense forcing its third straight punt to start the game early in the second quarter. Wilkes didn’t let the opportunity go to waste going on another promising drive on the ensuing possession. Dailey found Deemer again, this time for a 37-yard gain on a third down and long to move the Colonels to the Misericordia 22. After a Jeff Steeber 13-yard gain on the ground, Dailey hit Ryan Richards from eight yards out to extend the advantage to 23-0 following Hauck’s extra point. The teams traded punts on the next two possessions before a Wilkes drive stalled at the Misericordia 12 with just :41 on the clock until the half. Hauck entered on a fourth down and booted a 29-yard field goal to put the Colonels ahead 26-0 at the break. Misericordia finally got on the board in the third on a broken play that resulted in a 56-yard touchdown pass. On the ensuing Wilkes possession, Hauck added his third field goal of the contest, a 25-yarder to keep the Colonels in front 29-7 with 11:42 left in the third stanza. One more Hauck field goal made the score 32-7 before Isaiah Robinson picked off the Cougars quarterback and ran the interception back 33 yards for a Wilkes score putting the game out of reach late in the third quarter. The Dailey-to-Deemer connection was good one more time late in the fourth when the pair cashed in on a 20-yard touchdown to conclude the Colonel scoring up 46-23. Dailey enjoyed his finest outing of the season finishing 22-for-30 for 328 yards and three touchdowns. He also ran for 20 yards on five carries. Jacob Brook led six Colonels with 20 or more yards on the ground posting 72 yards and one score on 14 carries. Martin followed with 63 yards on 16 carries. Wilkes dominated up front in the trenches all game as evidence by its 230 yards rushing as a team in the win. Deemer led an active Wilkes receiver group finishing with nine catches for 168 yards and two scores. Devon Fink made two catches out of the backfield for 41 yards while Aaron Coyne added three receptions for 40 yards. Tanner Stengel led the Wilkes defense with nine tackles. Robinson followed with five stops and the pick six. As a unit, the Wilkes defense allowed just 14 Misericordia first downs in the game while limiting the Cougars to 88 yards rushing. Wilkes returns to MAC play next Saturday with a road game at Widener University (1-1, 1-0 MAC). Kickoff is set for 1:00 p.m. in Chester, Pa.